Scientists have found a direct link between physical contact and gut bacteria in red-bellied lemurs. Likely passed through ‘huddling’ behaviour and touch, the new research has implications for human health. The University of Oxford worked in collaboration with scientists from several universities, including the University of Arizona and Hunter College of the City University of New York (CUNY), on the research, published today in the Journal of Animal Ecology, to better understand causes of diversity within the animal’s gut microbiome, the community of various bacteria that live inside the intestine. These bacteria play a key role in both animal and human health, aiding digestion and tuning our individual immunity. The right mix of gut microbes set the parameters of our immune defence, blocking pathogens and informing our ability to recognise bacterial enemies, from friends. ‘In close social groups like red-bellied lemurs, social environment is key to immunity. Animals that touch each other more tend to spread microbes, both good and bad, but eventually frequent social contact leads to a synchronised microbiome. Because microbes tune immune defence, this can be seen as a form of cooperative immunity: Sharing microbial allies and enemies makes infections by opportunist pathogens less likely. Red-bellied lemurs are a very tactile, socially bonded species that live in small family groups of two to eight individuals, and spend a lot of time together. 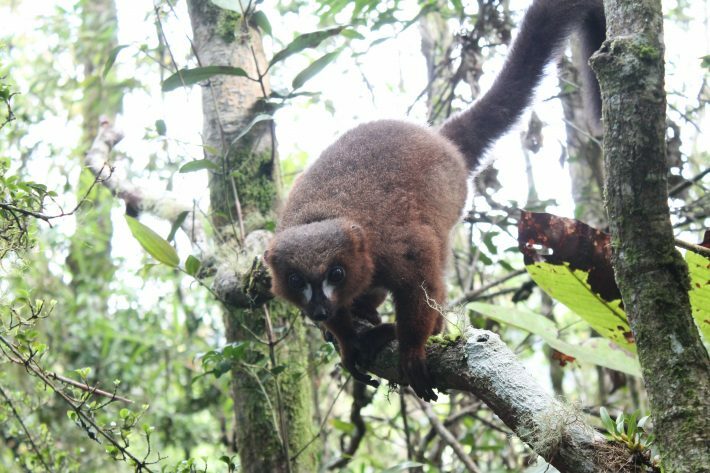 The study findings show that social groups of lemurs had markedly similar gut microbiomes and even within groups, individuals shared more similar gut community with their closest friends. The researchers suggest that sharing a similar microbiome within a social group may have a positive health impact, essentially harmonising the immune defence and preventing members from contracting dangerous infections. Since social bonds were associated with gut microbiota, information about gut bacteria could also be used to reconstruct the social network of their hosts: who’s been in contact with whom. The study includes some preliminary data around the relationship between social environment, social contact, bacterial transmission and hormonal changes, such as stress. The team are currently working to build on their initial observations, with new research understanding how an individual’s levels of the stress hormone cortisol are affected by their gut microbiome, as Aura explains: ‘Social contact, stress physiology and gut microbiome are all intensely related. Your social contact defines how much stress you interact with, and both can influence the cocktail of microbes in your gut.